At the f8 Developer Conference in April 2010, two Facebook engineers shared Facebook's EdgeRank formula, and since then most marketers have misinterpreted how to apply it to their own brand challenges. Simply put, this is Facebook's equation, not your brand's. This formula reveals how Facebook determines what will appear in users' newsfeeds, but it does not tell your brand what is needed to drive business success on Facebook. What Facebook shared about EdgeRank is important for marketers to understand, but it is merely a portion of the Facebook brand success formula. It is a little like the owner's manual for your car, which is helpful for learning how to operate the vehicle but does not tell you how to successfully, safely and efficiently get from point A to point B. Marketers must recognize EdgeRank, both for what it is and what it is not. Ue: Affinity between user and edge creator: Facebook monitors how much you interact with friends and brands. Those people and brands that earn your engagement--liking, sharing, commenting and so on--are more likely to appear in your newsfeed. The people and brands you tend to ignore eventually disappear because Facebook (correctly) interprets that you simply do not find their content interesting. Right off the bat, you can see the enormous challenge for brands: How can a brand possibly be as interesting to a user as his or her own friends? You can see this challenge demonstrated within your own personal newsfeed--you are presented with posts made by your friends much more often than from brands you have liked. In fact, many of the brands you have "liked" never appear in your newsfeed. This is not (just) Facebook's way to encourage brands to use paid sponsored posts to increase visibility; instead, it is the reality of your own Facebook habits. You find the people in your life more interesting than brands, and Facebook recognizes and reflects your authentic affinity. We: Weight for this edge: Every one of us reacts with different types of content differently--you may love videos, I may enjoy photos and someone else may prefer text. This means each content type has a different "weight" for each user. In addition, as an "edge" gains comments and likes, it gains more "weight;" thus, as others interact with an edge, it increases the likelihood that edge will appear in other people's newsfeeds. The more your brand posts match topics and content type to users' interests, the greater the weight of your content and the higher the likelihood your content will appear in fans' newsfeeds. De: Time decay factor for this edge: The last of Facebook’s EdgeRank attributes is a simple one: The more recent the post, the more likely you are to see it. You do not often launch Facebook and see something posted a week ago. Facebook knows that we are all real-time junkies--if a band is hot, a TV show is great, a meme is growing or our friends found a great party, we must know now! Facebook does not exist to give your brand the opportunity for free earned media. Its purpose is to give users a great social experience, which may include the brands that authentically earn their attention. Your brand can become invisible on Facebook. Consumers rarely visit brand pages; in fact, Facebook reports that fans are 40 to 150 times more likely to interact with brands on their newsfeeds than going to a brand page. If you disappear from consumers' newsfeeds, you disappear from Facebook. EdgeRank is Facebook's formula for keeping users' newsfeeds as interesting and relevant as possible, but this is far from the entire equation for brand success on Facebook. Two key components for Facebook marketing success are missing, and far too many marketers overlook these. What is missing? Well the first thing should be evident: Fans, but not just any fans, the right fans. Not all fans are created equal, although you would not know this given some of the relatively desperate methods brands use to accumulate "fans." EdgeRank tells us that brands must collect signals of affinity as quickly as possible, so the primary goal in your brand's fan accumulation strategy should not be raw numbers of fans but collecting the right fans--ones that arrive with some level of affinity or immediate potential for affinity. An interested customer is likely to interact with your brand, which tells Facebook he or she wants to see more from your brand. On the other hand, a disinterested fan fails to interact, resulting in the expulsion of the your brand from the fan's newsfeed. I have never understood why brands turn to general-interest sweepstakes and contests to earn "likes," for this seems to offer no path to Facebook success. The theory is that a fan acquired through these means will move up the value ladder--he or she may start as a disinterested prospect, but soon this person will become so enamored with the brand's wonderful content that the individual will rise to prospect, then customer and finally loyal advocate. This is the traditional advertising funnel view of the brand journey, and applying it to Facebook is, in the words of the immortal Joe Biden, "Malarkey!" Facebook's EdgeRank prevents disinterested prospects from gaining value. A new fan who was seduced by a contest or sweepstakes will see a few posts from your brand, and if they ignore these posts (and they will), your brand is gone. When this happens, your marketing investment will have incremented a number at the top of your fan page but delivered nothing else, least of all a prospect with an opportunity to see your brand's content within his or her newsfeed. In my Facebook success equation, I call this "Fans to the power of Affinity." Affinity does not grow your brand's Facebook success mathematically but exponentially. A fan with zero affinity stands almost no chance of seeing your content; a fan with modest affinity may or may not interact sufficiently to keep your brand present within his or her newsfeed; but a fan with strong existing affinity or the opportunity to gain it immediately can be a regular receiver, engager and sharer of your content. The second component that we must add to Facebook's EdgeRank equation is brand vector. This means that your content and interactions must move people closer to the brand. Engagement for engagement's sake may get your brand on fans' newsfeeds, but your brand must drive marketing value and not merely be seen. It is not enough to capture attention; you have to capture hearts and minds. If you collect "eyeballs" but fail to change perception or behavior around your brand, you've failed, no matter what your fan count or "talking about this" number says. Brands have long fallen into the trap of settling for mere likeability and engagement. One of my favorite pre-social-era examples of this is Taco Bell's Chihuahua. For years, Taco Bell ran ads with the popular pup telling people “Yo Quiero Taco Bell.” The dog abruptly disappeared from airwaves because the Chihuahua was more effective at selling T-shirts and plush animals than he was at selling tacos. In the language of the social era, Taco Bell settled for engagement but lacked brand vector. For a more recent example, look at Progressive's recent social media PR event. Angry customers flooded into Progressive's fan page to protest the company's handling of a claim. Progressive has the most popular fan page in insurance, at least as measured in simple metrics--4.7 million likes and 30,000 people talking about the brand--but despite those amazing numbers, Progressive saw little to no advocacy in the midst of the company's negative PR event. It is easy to see why: Flo posts lots of fun and games, but where is the discussion about risk, protecting families, the value of insurance or why Progressive is worth consideration? There is little brand vector evident in the engagement Flo creates, so Flo is just another popular character. That's great if Progressive produces sitcoms but is of dubious value if Progressive wishes to change awareness, consideration and intent around its financial products. 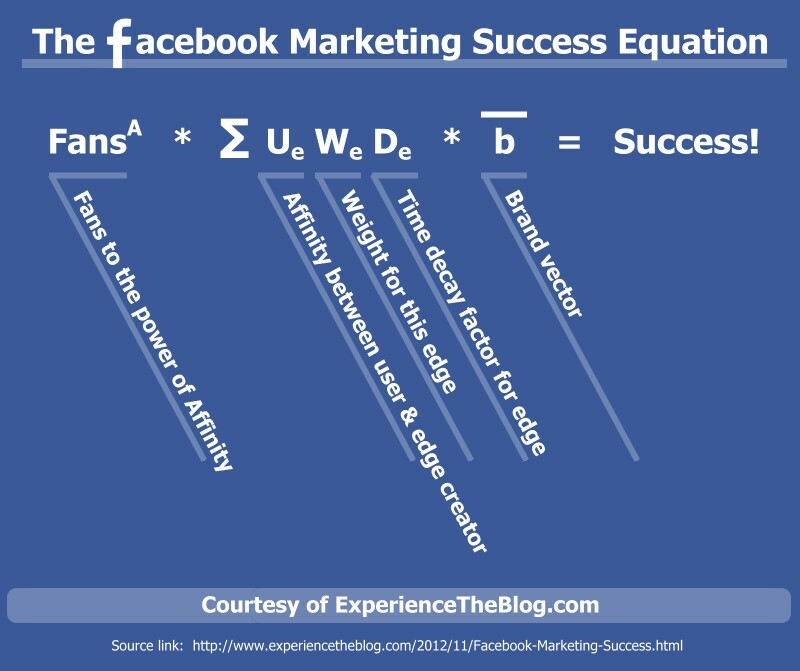 Here, in its complete form, is the entire Facebook success equation for marketers. 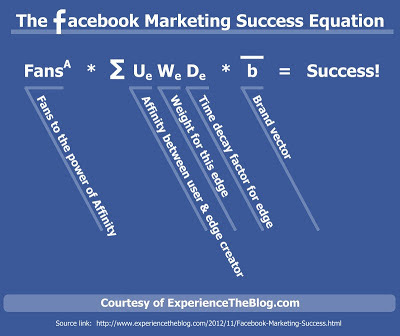 Not just Facebook's EdgeRank formula, but also the inclusion of the right fans and the right messaging. What do you think? Have I missed anything? Your comments are welcome and appreciated.
" Instead, you must find fans with affinity and keep that affinity to remain part of fans' Facebook experience." There are people who click "like" a lot who may not have any business with your brand. That's affinity, but not necessarily the right affinity. This is very evident with brands and social media agencies managing Facebook pages where the content is very "participatory" but not very brand relevant, as you outline in the next section. I think it's going to take a lot to ween brands off of their Likes addiction and to recommit themselves to content that would make customers happier and more informed. I hate to sound so dreary, but billions are spent on marketing each year moving market shares hardly at all. We're addicted to the wrong metrics--the brands that have understood the value of true relationships and loyalty have always succeeded better, but most brands cannot invest that way since short-term metrics like clicks and likes don't measure long-term value builders like relationships and loyalty. Excellent as always, I agree with most of what you say but because of the Edgerank algorithm, brand needs to 'play games'. We see a lot of superficial engagement between brands and fans even on some of the best pages. Examples are emotive images, fill in the blank questions etc but they are used to keep Edgerank numbers artificially high so that when substantive information is posted, it is, at least more likely to be seen. The 'quality' information unfortunately invariably generates few interactions. My solution would be for Facebook to weight interactions - a photo 'like' has little meaning yet a post 'share' requires thought before recommending it to a friend. A question for you - do you think that in time, the only predictable way brands will get on news feeds will be by paid for posts? And that it will be necessary to earn (from them) some fan interactions that will be useful to build some later organic placements.